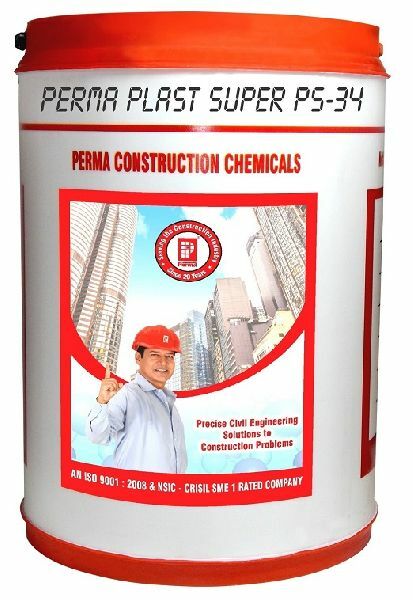 Perma Plast Super PS 34 is a multicomponent liquid admixture based on high molecular weight polymers and napthalene formaldehyde. The Perma Plast Super PS 34 is used to produce self-compacting flowing concrete and to produce high early strength concrete. We manufacture, export and supply the best quality Perma Plast Super PS 34 to our esteemed clients across the world. We provide Perma Plast Super PS 34 at the most reasonable prices. For the production of high workability concrete where heavily congested reinforcements exist, or poor access is available. Dosage : Field trials should be carried out with the given cement and aggregates to arrive at optimum dosages for the desired property to be achieved. However for guidance we specify a range of 0.5 to 1.5 percent by weight of cement for initiating trials based on type of concrete required. Packing : Perma Plast-super âï¿½ï¿½ PS34 is available in 25 kgs and 110 kgs drum.